Before I began work on the two big gifts due later this year, I realized I needed to knit and then full at least one swatch. Normally I don’t worry about gauge and size for felted items since the fulling process controls the end result. These two gifts I’m making are a bit more complicated than a simple bag, slipper, or hat. They need to fit reasonably well, and it would be awful if I went through all the knitting and oh-so-permanent felting to end up with too-small garments. You can see how different the swatch sizes are; the gray was my original, too-small swatch, and the green one is much better. 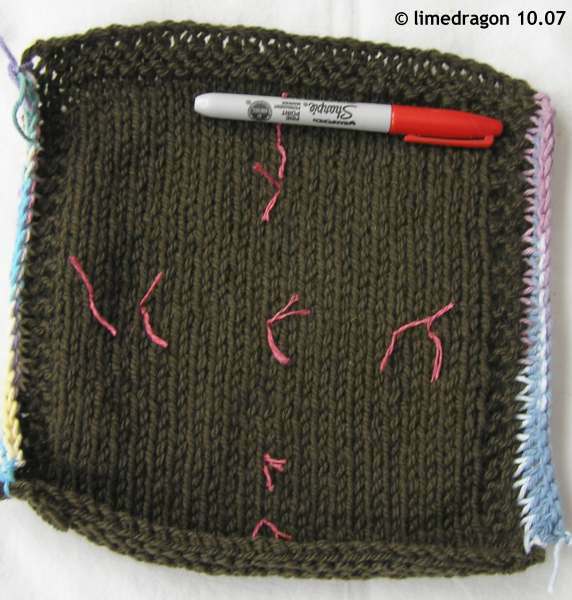 After centering the swatch, I marked off both pre- and post-felting stitch and row counts. 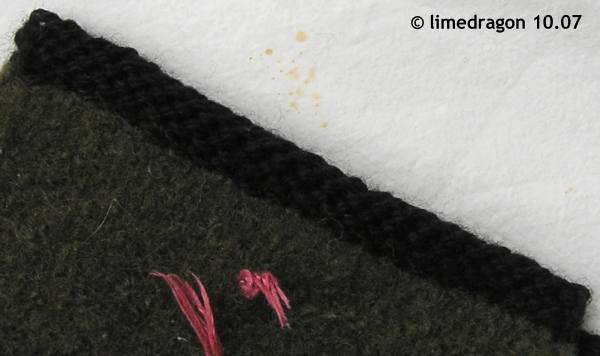 It’s only necessary to mark the post-felting gauge, but I did both for my peace of mind. 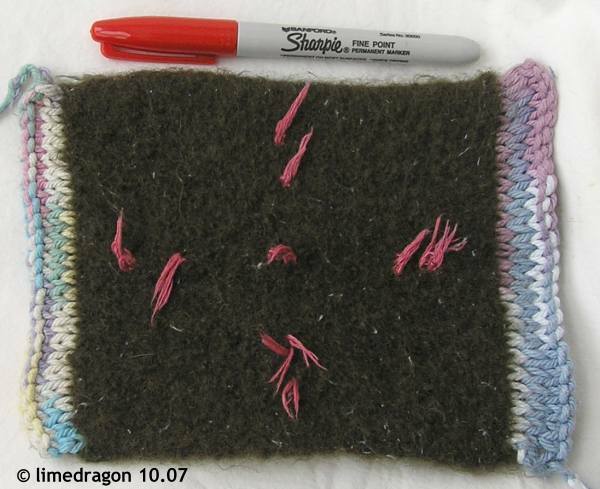 Also, cotton (or another non-felting) yarn must be used as markers. 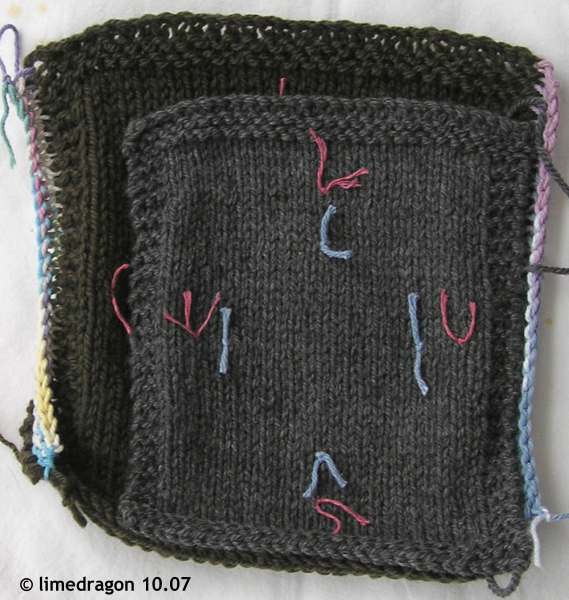 Another reason I wanted to test swatch is that this project has an edging that is knit-on after felting. I read through the directions and had a vague sense of how it worked. 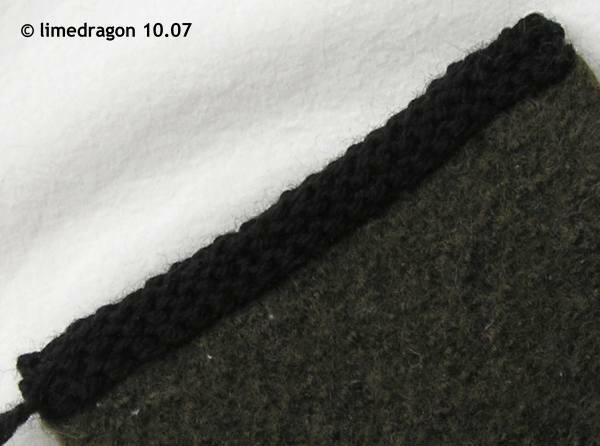 I thought about trying applied i-cord or an edging similar to what is used in the pattern to see how it would felt. In the end, I decided not to do this because I liked the subtly different textures of the felted and un-felted fabrics in the pattern photographs. But I did want some practice with the edging, so I added the temporary cotton edging to preserve some holes before finally throwing the swatch into the washer. The results were amazing; I love the matted fabric my swatch became. (I hope I never get tired of felting magic!) My stitch count, post-felting, was perfect. However, the row count was not. It was about a half-inch too short. My post-felting row gauge was about 8.5 rows per inch, when I needed 7.5 per inch. I’m so glad I went through all that preparation, because now I know that I need to adjust the row counts accordingly. And this task isn’t too terrible because Bev provides exact row counts for each section. Just a little bit of math and I’m good to go! The applied edging turned out wonderfully. It’s a roll of reverse stockinette finished with a three-needle bind off on the wrong side. It was very easy to work and gives a nice, finished look. What I love about this edging is that the wrong side looks great too. Wow! You were busy. I can’t wait to see the finished garment. I did some felting or “fulling” og my own, too, this weekend (although mine was not at all as scientific like yours). The whole process never ceases to amaze me. Your right – even your gauge sample looks amazing! Hey, Addi makes 10.75s Naturas – I think they’re 7.5mm. I have them for stuff like this! 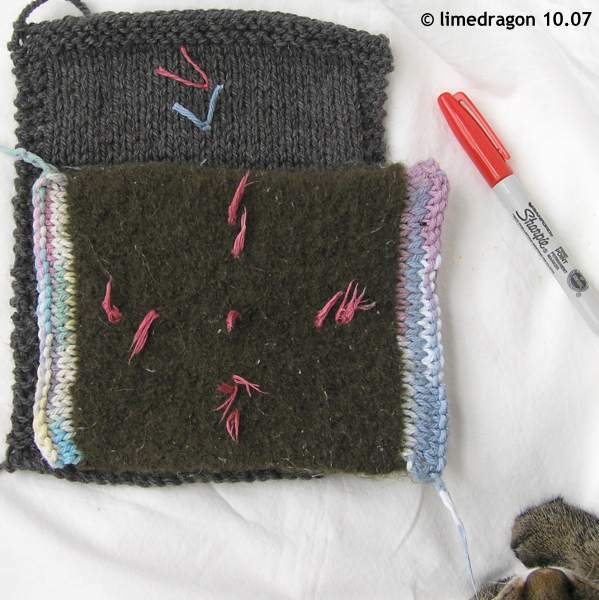 I did a swatch for one felting project – straps for a backpack. It worked out really well, although my process wasn’t as scientific as yours! Is that edging easier than applied i-cord, which is what I thought it was at first? Ooh I can’t wait to see what you’re making. I love that edge! I have a pair of felted slippers on the needles right now. I think I will give them as a Christmas gift. Intriguing project! Good luck with it. You’re certainly going about the swatching in a smart way. Wow…that’s a lot of prep work, but worth it, I’m sure. I can’t wait to see what it becomes. You have put a lot of thought into this project and I can’t wait to see the finished project! That looks like an intriguing project! Very cool and all scientific! But why not applied icord? Looks good though. Ooooooh (sounds of wonder and amazement)! Did you see the preview of the new interweave? Looks like a felted bag with a celtic motif. I’m actually really lazy making swatches for felt projects. But hats off for you for making swatches for felt projects. I really want to know what the end results will be. I happen to have Addi Turbo 7.0mm. I bought these needles from Ebay from a seller whom lives in Singapore and realized US size doesn’t have that size. Ever since then I don’t really refer to US sizes most of the time. That looks fantastic! I’ve been contemplating a felting project that will also require felting the swatches so I appreciate you sharing your method! I have to say I’m intrigued by what the project may be. This is a reminder of the fourth contest for the HSS2. Please e-mail celestina.quirell@gmail.com photos of your completed socks before you post them. Five points are given for each person who sends a photo, and she is going to be giving away a skein of sock yarn and some roving to the two randomly drawn winners. Wow, that is sure a lot of swatching! I loved reading about this process. I think your results will really pay off!